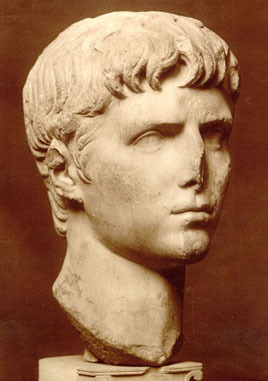 Augustus (from augeo, increase, venerable, majestic), the title given by the Roman senate, on the 17th of January 27 BC, to Gaius Julius Caesar Octavianus, or as he was originally designated, Gaius Octavius, in recognition of his eminent services to the state, and borne by him as the first of the Roman emperors. The title was adopted by all the succeeding Caesars or emperors of Rome long after they had ceased to be connected by blood with the first Augustus. Gaius Octavius was born in Rome on the 23rd of September 63 BC, the year of Cicero's consulship and of Catiline's conspiracy. He came of a family of good standing, long settled at Velitrae (Velletri), but his father was the first of the family to obtain a curule magistracy at Rome and senatorial dignity. His mother, however, was Atia, daughter of Julia, the wife of M. Atius Balbus, and sister of Julius Caesar, and it was this connection with the great dictator which determined his career. In his fifth year (58 BC) his father died; about a year later his mother remarried, and the young Octavius passed under her care to that of his stepfather, L. Marcius Philippus. At the age of twelve (51 BC) he delivered the customary funeral panegyric on his grandmother Julia, his first public appearance. On the 18th of October 48 (or 47) BC he assumed the "toga virilis" and was elected into the pontifical college, an exceptional honor which he no doubt owed to his great-uncle, now dictator and master of Rome. In 46 BC he shared in the glory of Caesar's African triumph, and in 45 he was made a patrician by the senate, and designated as one of Caesar's "masters of the horse" for the next year. In the autumn of 45, Caesar, who was planning his Parthian campaign, sent his nephew to study quietly at the Greek colony of Apollonia, in Illyria. Here the news of Caesar's murder reached him and he crossed to Italy. On landing he learned that Caesar had made him his heir and adopted him into the Julian gens, whereby he acquired the designation of Gaius Julius Caesar Octavianus. The inheritance was a perilous one; his mother and others would have dissuaded him from accepting it, but he, confident in his abilities, declared at once that he would undertake its obligations, and discharge the sums bequeathed by the dictator to the Roman people. Mark Antony had possessed himself of Caesar's papers and effects, and made light of his young nephew's pretensions. Brutus and Cassius paid him little regard, and dispersed to their respective provinces. Cicero, much charmed at the attitude of Antonius, hoped to make use of him, and flattered him to the utmost, with the expectation, however, of getting rid of him as soon as he had served his purpose. Octavianus conducted himself with consummate adroitness, making use of all competitors for power, but assisting none. Considerable forces attached themselves to him. The senate, when it armed the consuls against Antonius, called upon him for assistance; and he took part in the campaign in which Antonius was defeated at Mutina (43 BC). The soldiers of Octavianus demanded the consulship for him, and the senate, though now much alarmed, could not prevent his election. He now effected a coalition with Antonius and Lepidus, and on the 27th of November 43 BC the three were formally appointed a triumvirate for the reconstitution of the commonwealth for five years. They divided the western provinces among them, the east being held for the republic by Brutus and Cassius. They drew up a list of proscribed citizens, and caused the assassination of three hundred senators and two thousand knights. They further confiscated the territories of many cities throughout Italy, and divided them among their soldiers. Cicero was murdered at the demand of Antonius. The remnant of the republican party took refuge either with Brutus and Cassius in the East, or with Sextus Pompeius, who had made himself master of the seas. Octavianus and Antonius crossed the Adriatic in 42 BC to reduce the last defenders of the republic. Brutus and Cassius were defeated, and fell at the battle of Philippi. War soon broke out between the victors, the chief incident of which was the siege and capture by famine of Perusia, and the alleged sacrifice of three hundred of its defenders by the young Caesar at the altar of his uncle. But peace was again made between them (40 BC). Antonius married Octavia, his rival's sister, and took for himself the eastern half of the empire, leaving the west to Caesar. Lepidus was reduced to the single province of Africa. Meanwhile Sextus Pompeius made himself formidable by cutting off the supplies of grain from Rome. The triumvirs were obliged to concede to him the islands in the western Mediterranean. But Octavianus could not allow the capital to be kept in alarm for its daily sustenance. He picked a quarrel with Sextus, and when his colleagues failed to support him, undertook to attack him alone. Antonius, indeed, came at last to his aid, in return for military assistance in the campaign he meditated in the East. But Octavianus was well served by the commander of his fleet, M. Vipsanius Agrippa. Sextus was completely routed, and driven into Asia, where he perished soon afterwards (36 BC). Lepidus was an object of contempt to all parties, and Octavianus and Antonius remained to fight for supreme power. The five years (36-31 BC) which preceded the decisive encounter between the two rivals were wasted by Antony in fruitless campaigns, and in a dalliance with Cleopatra which shocked Roman sentiment. By Octavian they were employed in strengthening his hold on the West, and his claim to be regarded as the one possible savior of Rome and Roman civilization. His marriage with Livia Drusilla (38 BC) placed by his side a sagacious counsellor and a loyal ally, whose services were probably as great as even those of his trusted friend Marcus Agrippa. With their help he set himself to win the confidence of a public still inclined to distrust the author of the proscriptions of 43 BC. Brigandage was suppressed in Italy, and the safety of the Italian frontiers secured against the raids of Alpine tribes on the northwest and of Illyrians on the east, while Rome was purified and beautified, largely with the help of Agrippa (aedile in 33 BC). Meanwhile, indignation at Antony's un-Roman excesses, and alarm at Cleopatra's rumored schemes of founding a Greco-Oriental empire, were rapidly increasing. In 32 BC Antony's repudiation of his wife Octavia, sister of Octavian, and the discovery of his will, with its clear proofs of Cleopatra's dangerous ascendancy, brought matters to a climax, and war was declared, not indeed against Antony, but against Cleopatra. The decisive battle was fought on the 2nd of September 31 BC at Actium on the Epirot coast, and resulted in the almost total destruction of Antony's fleet and the surrender of his land forces. Not quite a year later (1st August 30 BC) followed the capture of Alexandria and the deaths by their own hands of Antony and Cleopatra. On the 11th of January 29 BC the restoration of peace was marked by the closing of the temple of Janus for the first time for 200 years. In the summer Octavian returned to Italy, and in August celebrated a three days' triumph. He was welcomed, not as a successful combatant in a civil war, but as the man who had vindicated the sovereignty of Rome against its assailants, as the savior of the republic and of his fellow citizens, above all as the restorer of peace. He was now, to quote his own words, "master of all things", and the Roman world looked to him for some permanent settlement of the distracted empire. His first task was the re-establishment of a regular and constitutional government, such as had not existed since Julius Caesar crossed the Rubicon twenty years before. To this task he devoted the next eighteen months (August 29 to January 27, 27 BC). The "principate", to give the new form of government its most appropriate name, was a compromise thoroughly characteristic of the combination of tenacity of purpose with cautious respect for forms and conventions which distinguished its author. The republic was restored; senate, magistrates and assembly resumed their ancient functions; and the public life of Rome began to run once more in the familiar grooves. The triumvirate with its irregularities and excesses was at an end. The controlling authority, which, Octavian himself wielded, could not indeed be safely dispensed with. But henceforward he was to exercise it under constitutional forms and limitations, and with the express sanction of the senate and people. Octavian was legally invested for a period of ten years with the government of the important frontier provinces, with the sole command of the military and naval forces of the state, and the exclusive control of its foreign relations. At home it was understood that he would year by year be elected consul, and enjoy the powers and pre-eminence attached to the chief magistracy of the Roman state. Thus the republic was restored under the presidency and patronage of its "first citizen" (princeps civitatis). In acknowledgment of this happy settlement and of his other services further honors were conferred upon Octavian. On the 13th of January 27 BC, the birthday of the restored republic, he was awarded the civic crown to be placed over the door of his house, in token that he had saved his fellow citizens and restored the Republic. Four days later (January 17) the senate conferred upon him the cognomen of Augustus. But it was not only the machinery of government in Rome that needed repair. Twenty years of civil war and confusion had disorganized the empire, and the strong hand of Augustus, as he must now be called, could alone restore confidence and order. Towards the end of 27 BC he left Rome for Gaul, and from that date until October 19 BC he was mainly occupied with the reorganization of the provinces and of the provincial administration, first of all in the West and then in the East. It was during his stay in Asia (20 BC) that the Parthian king Phraates voluntarily restored the Roman prisoners and standards taken at Carrhae (53 BC), a welcome tribute to the respect inspired by Augustus, and a happy augury for the future. In October 19 BC he returned to Rome, and the senate ordered that the day of his return (October 12) should thenceforward be observed as a public holiday. The period of ten years for which his imperium had been granted him was nearly ended, and though much remained to be done, very much had been accomplished. The pacification of northern Spain by the subjugation of the Astures and Cantabri, the settlement of the wide territories added to the empire by Julius Caesar in Gaul -- the "New Gaul", or the "long-haired Gaul" (Gallia Comata) as it was called by way of distinction from the old province of Gallia Narbonensis -- and the re-establishment of Roman authority over the kings and princes of the Near East, were achievements which fully justified the acclamations of senate and people. In 18 BC Augustus's imperium was renewed for five years, and his tried friend Marcus Agrippa, now his son-in-law, was associated with him as a colleague. From October of 19 BC until the middle of 16 BC Augustus's main attention was given to Rome and to domestic reform, and to this period belong such measures as the Julian law "as to the marriage of the orders." In June of 17 BC the opening of the new and better age, which he had worked to bring about, was marked by the celebration in Rome of the Secular games. The chief actors in the ceremony were Augustus himself and his colleague Agrippa -- while, as the extant record tells us, the processional hymn, chanted by youths and maidens first before the new temple of Apollo on the Palatine and then before the temple of Jupiter on the Capitol, was composed by Horace. The hymn, the well-known Carmen Saeculare, gives fervent expression to the prevalent emotions of joy and gratitude. In the next year (16 BC), however, Augustus was suddenly called away from Rome to deal with a problem which engrossed much of his attention for the next twenty-five years. The defeat of Marcus Lollius, the legate commanding on the Rhine, by a horde of German invaders, seems to have determined Augustus to take in hand the whole question of the frontiers of the empire towards the north, and the effective protection of Gaul and Italy. The work was entrusted to Augustus's stepsons Tiberius and Drusus. The first step was the annexation of Noricum and Raetia (16-15 BC), which brought under Roman control the mountainous district through which the direct routes lay from North Italy to the upper waters of the Rhine and the Danube. East of Noricum Tiberius reduced to order for the time the restless tribes of Pannonia, and probably established a military post at Carnuntum on the Danube. To Drusus fell the more ambitious task of advancing the Roman frontier line from the Rhine to the Elbe, a work which occupied him until his death in Germany in 9 BC. In 13 BC Augustus had returned to Rome; his return, and the conclusion of his second period of rule, were commemorated by the erection of one of the most beautiful monuments of the Augustan age, the Ara Pacis Augustae. His imperium was renewed, again for five years, and in 12 BC, on the death of his former fellow triumvir Lepidus, he was elected Pontifex Maximus. But this third period of his imperium brought with it losses which Augustus must have keenly felt. Only a few months after his reappointment as Augustus's colleague, Marcus Agrippa, his trusted friend since boyhood, died. As was fully his due, his funeral oration was pronounced by Augustus, and he was buried in the mausoleum near the Tiber built by Augustus for himself and his family. Three years later his brilliant stepson Drusus died on his way back from a campaign in Germany, in which he had reached the Elbe. Finally in 8 BC he lost the comrade who next to Agrippa had been the most intimate friend and counsellor of his early manhood, Gaius Cilnius Maecenas, the patron of Virgil and Horace. For the moment Augustus turned, almost of necessity, to his surviving stepson. Tiberius was associated with him as Agrippa had been in the tribunician power, was married against his will to Julia, and sent to complete his brother Drusus's work in Germany (7-6 BC). But Tiberius was only his stepson, and, with all his great qualities, was never a very lovable man. On the other hand, the two sons of Agrippa and Julia, Gaius and Lucius, were of his own blood and evidently dear to him. Both had been adopted by Augustus (17 BC). In 6 BC Tiberius, who had just received the tribunician power, was transferred from Germany to the East, where the situation in Armenia demanded attention. His sudden withdrawal to Rhodes has been variously explained, but, in part at least, it was probably due to the plain indications which Augustus now gave of his wish that the young Caesars should be regarded as his heirs. The elder, Gaius, now fifteen years old (5 BC), was formally introduced to the people as consul-designate by Augustus himself, who for this purpose resumed the consulship (12th) which he had dropped since 23 BC, and was authorized to take part in the deliberations of the senate. Three years later (2 BC) Augustus, now consul for the 13th and last time, paid a similar compliment to the younger brother Lucius. In 1 BC Gaius was given proconsular imperium, and sent to re-establish order in Armenia, and a few years afterwards (AD 2) Lucius was sent to Spain, apparently to take command of the legions there. But the fates were unkind; Lucius fell sick and died at Marseilles on his way out, and in the next year (AD 3) Gaius, wounded by an obscure hand in Armenia, started reluctantly for home, only to die in Lycia. Tiberius alone was left, and Augustus, at once accepting facts, formally and finally declared him to be his colleague and destined successor (AD 4) and adopted him as his son. The interest of the last ten years of Augustus's life centers in the events occurring on the northern frontier. The difficult task of bringing the German tribes between the Rhine and the Elbe under Roman rule, commenced by Drusus in 13 BC, had on his death been continued by Tiberius (9-6 BC). During Tiberius's retirement in Rhodes no decisive progress was made, but in AD 4 operations on a large scale were resumed. From Velleius Paterculus, who himself served in the war, we learn that in the first campaign Roman authority was restored over the tribes between the Rhine and the Weser, and that the Roman forces, instead of returning as usual to their headquarters on the Rhine, went into winter-quarters near the source of the Lippe. In the next year (AD 5) the Elbe was reached by the troops, while the fleet, after a hazardous voyage, arrived at the mouth of the same river and sailed some way up it. Both feats are deservedly commemorated by Augustus himself in the Ancyran monument. To complete the conquest of Germany and to connect the frontier with the line of the Danube, it seemed that only one thing remained to be done, to break the power of the Marcomanni and their king Maroboduus. In the spring of AD 6 preparations were made for this final achievement; the territory of the Marcomanni (Bohemia) was to be invaded simultaneously by two columns. One, starting apparently from the headquarters of the army of Upper Germany at Mainz, was to advance by way of the Black Forest and attack Maroboduus on the west; the other, led by Tiberius himself, was to start from the new military base at Carnuntum on the Danube and operate from the southeast. But the attack was never delivered, for at this moment, in the rear of Tiberius, the whole of Pannonia and Dalmatia burst into a blaze of insurrection. The crisis is pronounced by Suetonius to have been more serious than any which had confronted Rome since the war with Hannibal, for it was not merely the loss of a province but the invasion of Italy that was threatened, and Augustus openly declared in the senate that the insurgents might be before Rome in ten days. He himself moved to Ariminum to be nearer the seat of war, recruiting was vigorously carried on in Rome and Italy, and legions were summoned from Moesia and even from Asia. In the end, and not including the Thracian cavalry of King Rhoemetalces, a force of 15 legions with an equal number of auxiliaries was employed. Even so the task of putting down the insurrection was difficult enough, and it was not until late in the summer of AD 9, after three years of fighting, that Germanicus Caesar, who had been sent to assist Tiberius, ended the war by the capture of Andetrium in Dalmatia. Five days later the news reached Rome of the disaster to Varus and his legions, in the heart of what was to have been the new province of Germany beyond the Rhine. The disaster was avowedly due entirely to Varus's incapacity and vanity, and might no doubt have been repaired by leaders of the calibre of Tiberius and Germanicus. Augustus, however, was now seventy-two, the Dalmatian outbreak had severely tried his nerve, and now for the second time in three years the fates seemed to pronounce clearly against a further prosecution of his long-cherished scheme of a Roman Germany reaching to the Elbe. All that was immediately necessary was done. Recruiting was pressed forward in Rome, and first Tiberius and then Germanicus were despatched to the Rhine. But the German leaders were too prudent to risk defeat, and the Roman generals devoted their attention mainly to strengthening the line of the Rhine. The defeat of Varus, and the tacit abandonment of the plans of expansion begun twenty-five years before, are almost the last events of importance in the long principate of Augustus. The last five years of his life (AD 10-14) were untroubled by war or disaster. Augustus was ageing fast, and was more and more disinclined to appear personally in the senate or in public. Yet in AD 13 he consented, reluctantly we are told, to yet one more renewal of his imperium for ten years, stipulating, however, that his stepson Tiberius, himself now over fifty, should be associated with himself on equal terms in the administration of the empire. Early in the same year (January 16, AD. 13) the last triumph of his principate was celebrated. Tiberius was now in Rome, the command on the Rhine having been given to Germanicus, who went out to it immediately after his consulship (AD. 12), and the time had come to celebrate the Dalmatian and Pannonian triumph, which the defeat of Varus had postponed. Augustus witnessed the triumphal procession, and Tiberius, as it turned from the Forum to ascend the Capitol, halted, descended from his triumphal car, and did reverence to his adopted father. One last public appearance Augustus made in Rome. During AD 13 he and Tiberius conducted a census of Roman citizens, the third taken by his orders; the first having been in 28 BC at the very outset of his rule. The business of the census lasted over into the next year, but on the 11th of May, AD 14, before a great crowd in the Campus Martius, Augustus took part in the solemn concluding ceremony of burying away out of sight the old age and inaugurating the new. The ceremony had been full of significance in 28 BC, and now more than forty years later it was given a pathetic interest by Augustus himself. When the tablets containing the vows to be offered for the welfare of the state during the next lustrum were handed to him, he left the duty of reciting them to Tiberius, saying that he would not take vows which he was never destined to perform. It was apparently at the end of June or early in July that Augustus left Rome on his last journey. Travelling by road to Astura (Torre Astura) at the southern point of the little bay of Antium, he sailed from there to Capri and to Naples. On his way at Puteoli, the passengers and crew of a ship just come from Alexandria cheered the old man by their spontaneous homage, declaring, as they poured libations, that to him they owed life, safe passage on the seas, freedom and fortune. At Naples, in spite of increasing disease, he bravely sat out a gymnastic contest held in his honor, and then accompanied Tiberius as far as Beneventum on his way to Brundusium and Illyricum. On his return he was forced by illness to stop at Nola, his father's old home. Tiberius was hastily recalled and had a last confidential talk on affairs of state. From this point forward, says Suetonius, he gave no more thought to such great affairs. He bade farewell to his friends, inquired after the health of Drusus's daughter who was ill, and then quietly expired in the arms of the wife who for more than fifty years had been his most intimate and trusted guide and counsellor, and to whom his last words were an exhortation to "live mindful of our wedded life." He died on the 19th of August, AD 14, in the same room in which his father had died before him, and on the anniversary of his entrance upon his first consulship fifty-seven years before (43 BC). The corpse was carried to Rome in slow procession along the Appian Way. On the day of the funeral it was borne to the Campus Martius on the shoulders of senators and there burnt. The ashes were reverently collected by Livia, and placed in the mausoleum by the Tiber which her husband had built for himself and his family. The last act was the formal decree of the senate by which Augustus, like his father Julius before him, was added to the number of the gods recognized by the Roman state. If we except writers like Voltaire who could see in Augustus only the man who had destroyed the old republic and extinguished political liberty, the verdict of posterity on Augustus has varied just in proportion as his critics have fixed their attention, mainly, on the means by which he rose to power, or the use which he made of the power when acquired. The lines of argument followed respectively by friendly and hostile contemporaries immediately after his death have been followed by later writers with little change. But of late years, our increasing mistrust of the current gossip about him, and our increased knowledge of the magnitude of what he actually accomplished, have conspicuously influenced the judgments passed upon him. We allow the faults and crimes of his early manhood, his cruelties and deceptions, his readiness to sacrifice everything that came between him and the end he had in view. On the other hand, a careful study of what he achieved between the years 38 BC, when he married Livia, and his death in AD 14, is now held to give him a claim to rank, not merely as an astute and successful intriguer, or an accomplished political actor, but as one of the world's great men, a statesman who conceived and carried through a scheme of political reconstruction which kept the empire together, secured peace and tranquillity, and preserved civilization for more than two centuries.